I had thoroughly enjoyed my visit to the Organic Market of San Miguel de Allende. 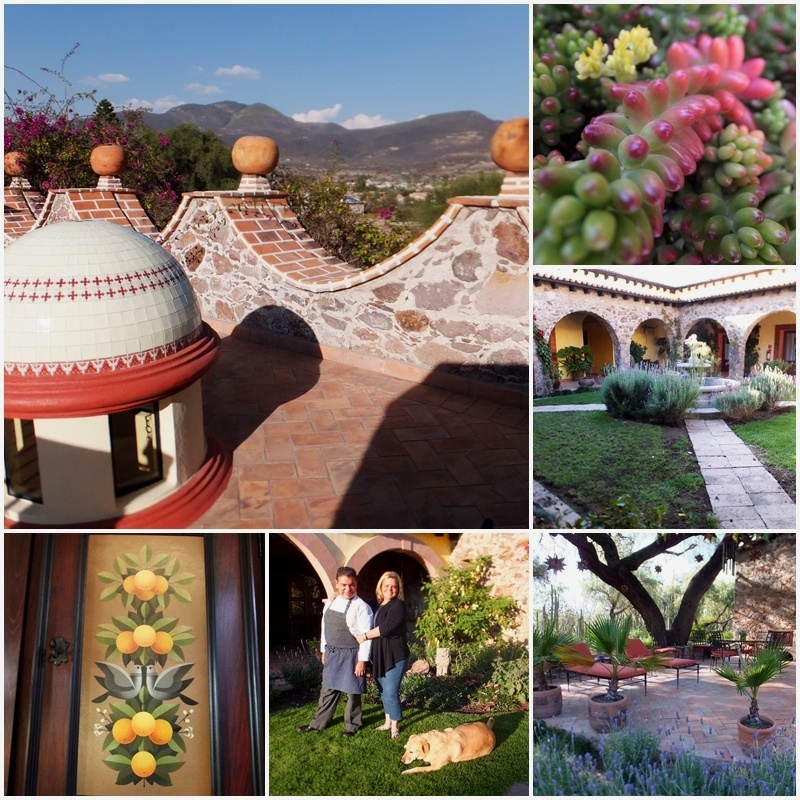 Around 1 pm I was picked up and driven to “La Hacienda Purisima de Jalpa”, an organic farm and country hotel. General manager Susan Cermeño and chef Enrique Ferjeat planned to give me a tour of this extensive property. 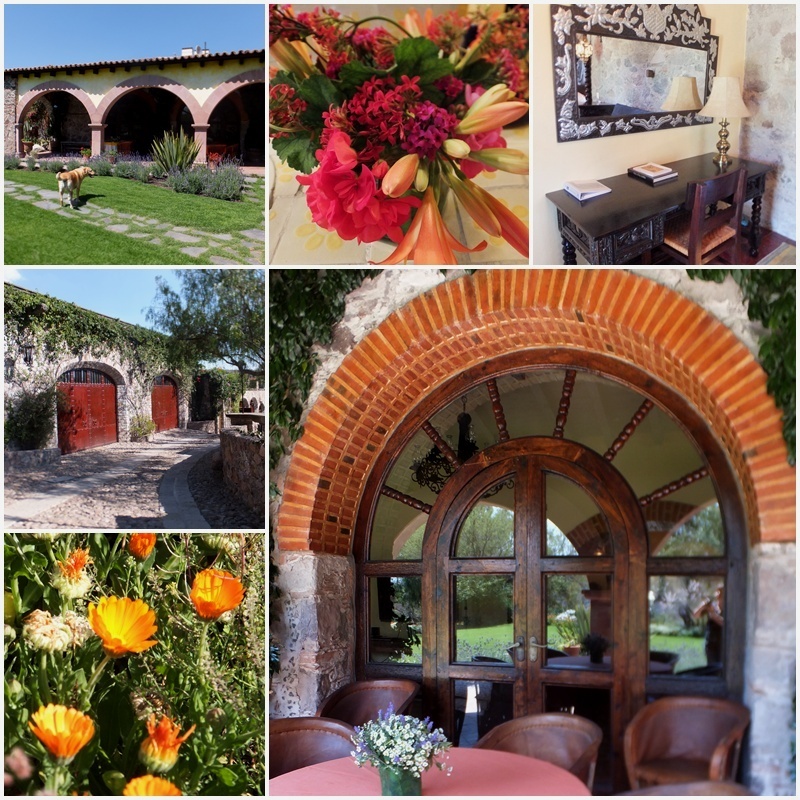 Located in a fertile valley of three extinct volcanoes, this hacienda and its six guest bedrooms make it a favourite getaway for people in search of romantic escapes, family gatherings, corporate retreats and spiritual renewal. The oldest part of the farm dates back to 1730 when it grew wheat for the silver mines of Guanajuato. Before we embarked on a walking tour of the farm at La Hacienda Purisima de Jalpa, chef Enrique Ferjeat, who trained at the illustrious Ritz in Paris, surprised us with an amazing meal. We started with a green, very healthy and surprisingly good-tasting concoction called “Orange agua fresca with parsley”. Then we got to taste organic olives, grown on the farm, with Cotija cheese, followed by a Purisima organic salad with brie and wild strawberry vinaigrette and a celery root soup with pine nuts. The main course consisted of Corn esquites in white wine cream with salmon, clams and baby vegetables which we capped off with a flourless chocolate cake with red wine coulis. After these exquisite gastronomic delights we were definitely ready for a walking tour. 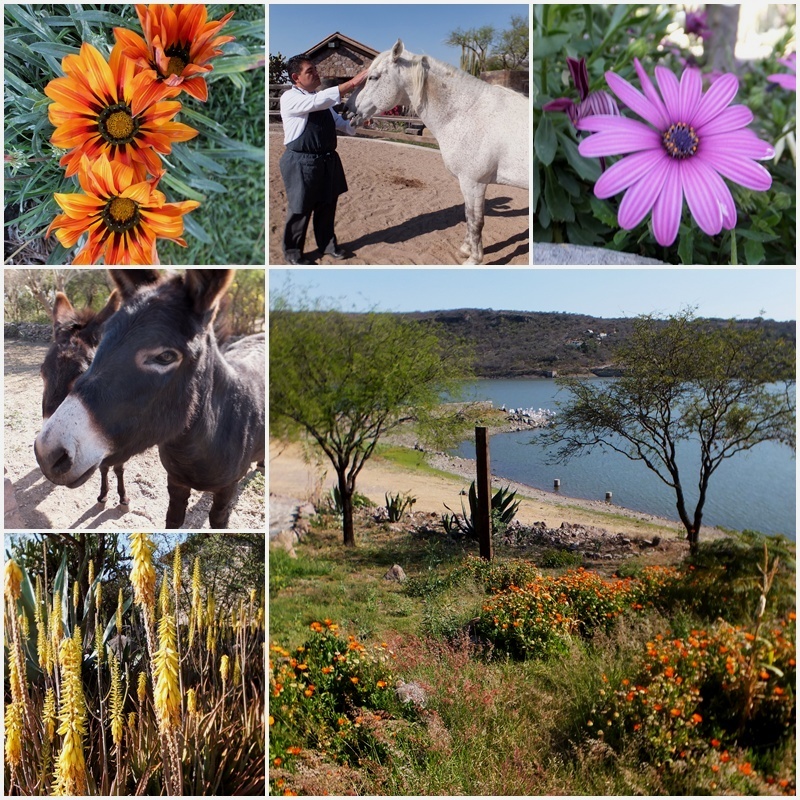 After our lovely meal, Chef Enrique Ferjeat took me on a tour of Hacienda Purisima de Jalpa, starting with the amphiteatre and the beach area next to the irrigation dam. Then we checked out the various fields and greenhouses with the organic vegetables that are grown on the farm and delivered to many top-notch restaurants locally and far-away. The farm also has two donkeys (a mother and daughter team), several horses, a goose (who lost his partner to a raid by a jackal recently), three cats and three dogs. 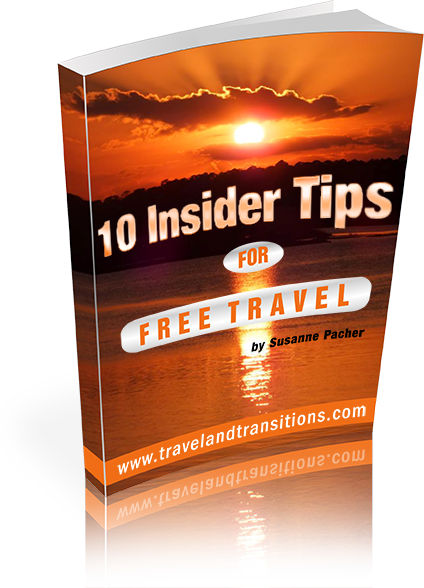 Visitors to this local farm and boutique hotel can certainly enjoy the country life first hand. More than 30 local families are employed here at Hacienda Purisima de Jalpa, and the owner Janet Onnen is very involved in giving back and helping the local community. Finally, at the end of the afternoon, I got a tour of Benja’s Cottage, a spacious retreat that was named after the former caretaker of the property who worked here for 40 years. Not only does this cottage have a gorgeous large room with a king-size bed, fireplace, mini-bar and a luxurious bathroom, but it also has a wonderful rooftop terrace that offers a magnificent view over the entire area. I had thoroughly enjoyed my visit to Hacienda Purisima de Jalpa and could understand now why many people keep returning here year after year. Towards the evening I got back to San Miguel de Allende and took a brief walk around downtown. 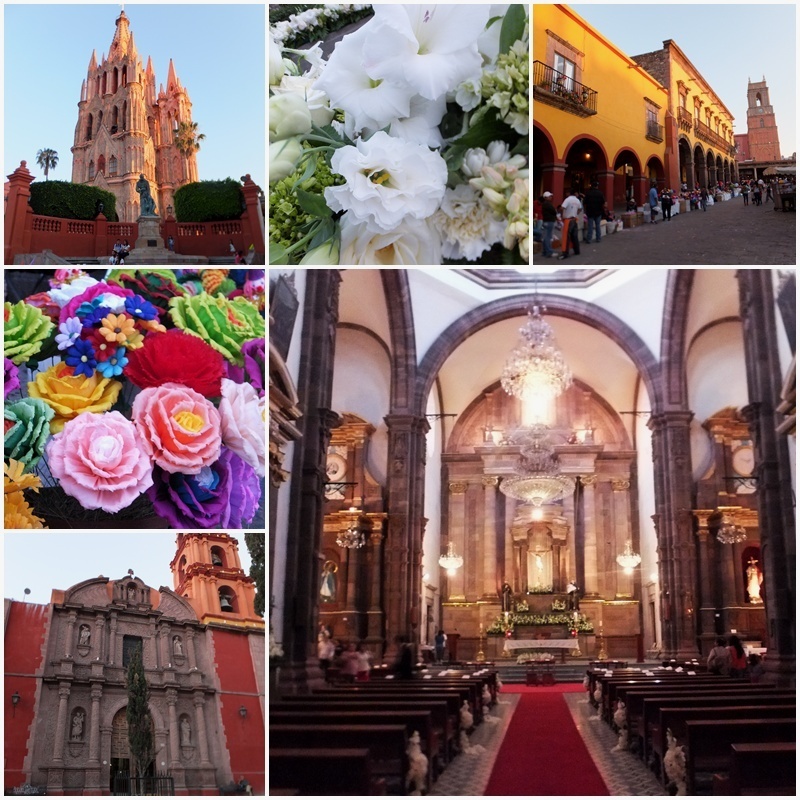 I felt a cold coming on and my head was totally congested, so I had to cut my explorations short, but I did visit two of the many historic churches that are located in San Miguel: San Francisco and the Iglesia de Nuestra Señora de la Salud. The downtown of San Miguel was extremely lively and people were milling about everywhere. At sunset I took the public bus back to my accommodation and headed to bed with a fever, trying to recover enough for another round of explorations on Sunday.